Solid Vinyl vs. Mesh Inground Winter Pool Covers: Which is Better? When pool owners are sadly at the end of the swimming season, the topic of pool covers often comes up. 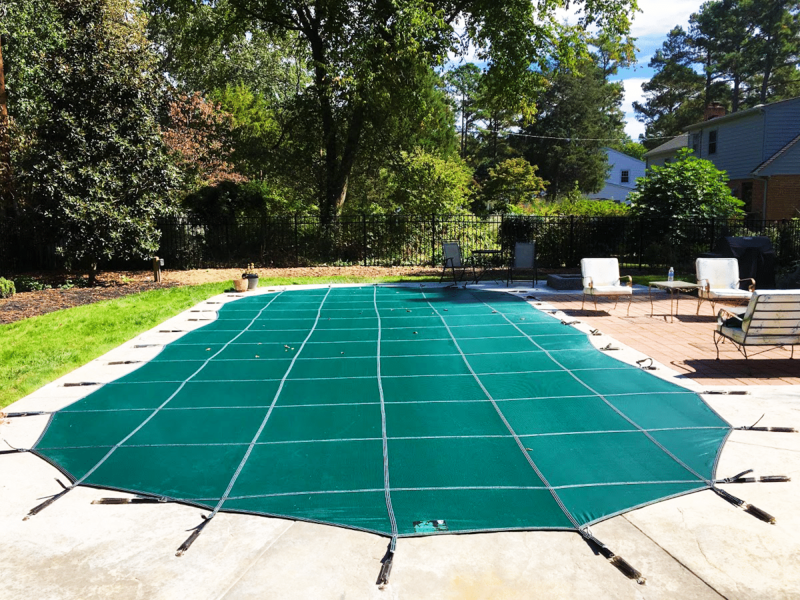 Many pool owners elect to upgrade from their standard tarp-style winter cover to a stronger, more permanent security-style swimming pool cover. We understand this desire to upgrade, considering tarp covers are poor winter covers. They require a pump on top to keep any water off and only last 1–3 years before they need to be replaced. Once someone has decided to go with an upgraded winter cover, the question then turns to whether a solid or mesh cover will suit their needs the best. So what are the pros and cons of each type of security-style winter pool cover? Mesh pool covers typically cost $200–$600 less than a solid vinyl pool cover and last 10–15 years. They don't need a pump on top and generally require no work during the offseason. However, the pool water gets dirty and algae can grow. Solid vinyl pool covers last 7–11 years and keep the pool water clean so that it requires less maintenance in the spring. However, they cost more than mesh covers and need a pump. Mesh covers typically cost $200–$600 less than a solid vinyl pool cover. Mesh covers typically last longer than vinyl covers. I've found the average lifespan for a mesh cover to be 10–15 years. Water passing through the mesh cover isn't necessarily clean. For example, when leaves fall on your pool cover during the winter and it rains, the leaves will cause the rain water to become very dirty. With a mesh cover, the dirty water will just pass right on through to the pool water. The mesh also lets sunlight pass through, which can cause early algae growth. Read: even more cleaning. The main advantage to a solid vinyl winter pool cover is the fact that it does not allow sunlight to pass through. This is important because in the spring when the pool water starts to warm up, algae will grow on the walls if it has contact (as it does with a mesh cover) to sunlight. This is also why people with mesh security covers tend to open up their pools a little earlier (before it gets too warm) than those with solid covers. Along with keeping sunlight out, solid vinyl covers keep water out of the pool as well. This allows the pool water to stay much cleaner. A solid cover typically costs $200–$600 more than a mesh cover. The submersible pumps used with solid vinyl covers usually only last 2–4 years before they break down. These pumps can also be rather costly, often $200–$250 each. Knowing the benefits of each, cover manufacturers like Loop-Loc and others have now begun to produce hybrid-style covers that share some of the best features of each. For example, Loop-Loc makes a cover that is solid vinyl with a small mesh opening in the middle. With such a design, this cover prevents most sunlight from passing through to the water, but it also does not need a submersible pump on top. Further questions or comments regarding pool covers? Just leave a comment below. As always, don't forget to subscribe to our blog to receive all the latest news, tips, and information for swimming pool owners.